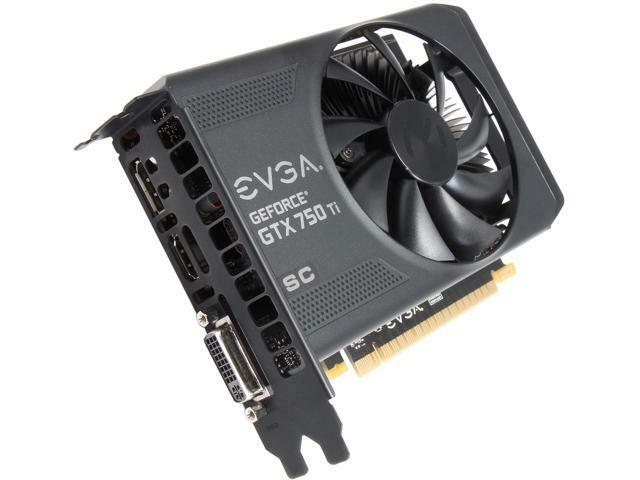 A new choice of weapon for serious gamers, the EVGA GeForce GTX 750 Ti delivers powerful yet ultra-efficient performance at an incredible value. Based on the next-gen NVIDIA Maxwell architecture, the GTX 750 Ti boasts 640 CUDA Cores and a 2GB GDDR5 memory that work side by side, delivering 25% more performance and up to twice the power efficiency of previous generation GPUs - you can effortlessly game in Full 1080p HD in today's most hot titles. Plus, with GeForce GTX gaming technologies like NVIDIA GPU Boost, G-SYNC, and GeForce Experience, you'll get a fully evolved experience in your PC gaming. This model is factory overclocked to 1176MHz Base Clock/1255MHz Boost Clock for smoother gameplay. NVIDIA GPU Boost 2.0 Technology Dynamically maximizes clock speeds based on workload and allows enthusiast class controls, such as temperature target and fan controls, extra over-voltage headroom, and optimizations for water-cooling solutions. This allows greater customization and overclocking options and enables gamers to push performance to new levels. NVIDIA G-SYNC NVIDIA G-SYNC monitors feature revolutionary NVIDIA technology that eliminates screen tearing and VSync input lag, and enhances the capabilities of existing monitor panels, resulting in the smoothest, fastest, most responsive gaming experience ever seen. The result: scenes appear instantly. Objects are sharper. Game play is smoother. Every time. GeForce Experience with ShadowPlay The easiest way to optimize your games and keep your drivers up to date, The GeForce Experience application automatically notifies you of new driver releases from NVIDIA. With a single click, you’ll be able to update the driver directly, without leaving your desktop. The latest version introduces GeForce ShadowPlay. Fast, free and easy-to-use, ShadowPlay is a new approach to gameplay recording, utilizing an on-board H.264 encoder built into GeForce GTX 600 and 700 Series graphics cards, and an innovative recording mode that shadows your every in-game move. NVIDIA PhysX Technology Full support for NVIDIA PhysX technology, enabling a totally new class of physical gaming interaction for a more dynamic and realistic experience with GeForce. NVIDIA TXAA Technology TXAA combines the power of Multi-Sampling Anti-Aliasing (MSAA) with sophisticated NVIDIA developed filters to produce perfect smooth images. In addition, TXAA can also samples the entire scene between frames to reduce shimmering, known technically as temporal aliasing. TXAA 4x offers image fidelity superior to 8xMSAA, with a performance impact comparable to 4xMSAA. NVIDIA 3D Vision Surround Ready NVIDIA 3D Vision brings a fully immersive, stereoscopic 3D experience to the PC. A combination of high-tech wireless glasses and advanced software, 3D Vision transforms hundreds of PC games into full stereoscopic 3D. Get up to two times the monitor and keyboard brightness with NVIDIA 3D LightBoost technology. In addition, you can enjoy 3D movies and 3D digital photographs from 3DVisionLive.com in eye-popping, crystal-clear quality. This item is covered by Atlanta Electronics LLC Return Policy.